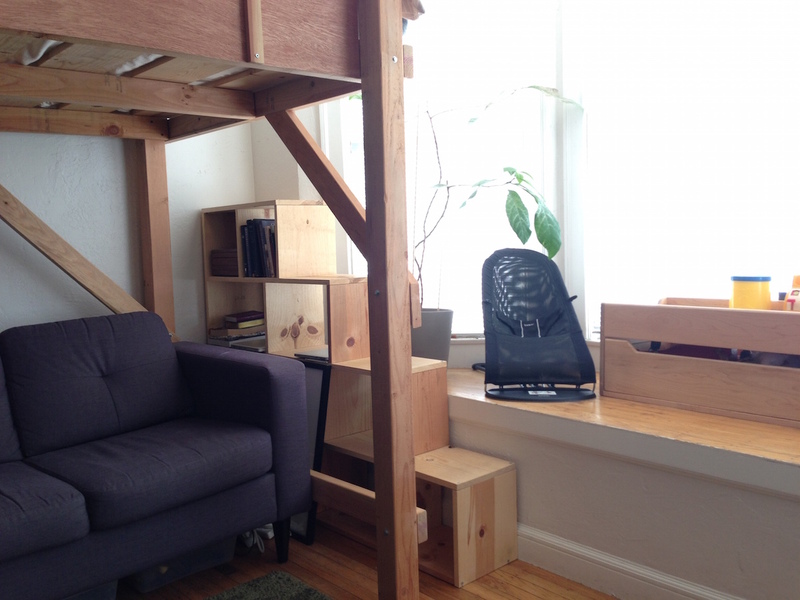 Between July 2011 and August 2015 I lived in a ~400sqft studio apartment in San Francisco. I moved in a bachelor but by the time I moved out, I was one member of a four person family. Here are some things I learned along the way. San Francisco has a rent control policy that prohibits most landlords from raising rent more than ~1% per year. The goal is to help fight against families getting displaced. My last days as a bachelor. The house had more surfboards than furniture and we somehow had room for a piano. When my wife and I got married and she moved in, we considered moving. Our budget had increased some, but our purchasing power had dropped. We could change neighborhoods, but we’d be sacrificing in apartment quality. We decided to stay. A year and a half later, we welcomed our first son into the world. At that point rent in the city had risen by over 50%. We were dropping to one income so my wife could be a full time mom, and we chose not to shoulder a rent increase simultaneously. Babies are not very big. He wouldn’t take up much space. So I built us a custom bed in the closet and we put the baby bassinet in the main room. We became very good at whispering. The kitchen was the area of the house that changed most dramatically when my wife moved it. It was quite spartan when I was a bachelor as most nights I worked late and ordered in. She did a really nice job making use of the small space. Seven months after our first child was born, we found out we would be having another baby. Part of our plan, but maybe a bit sooner than expected. Sometimes those things take a while, and sometimes they don’t. 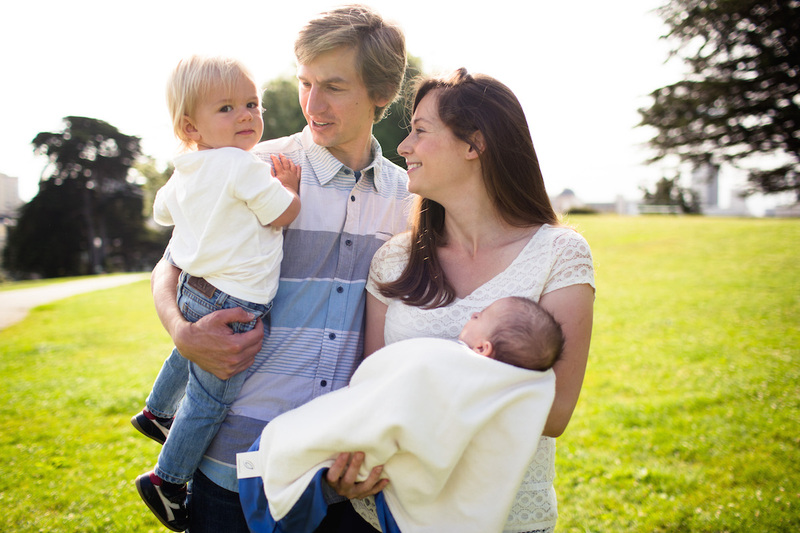 As the pregnancy progressed, our oldest son started walking and, like his dad, was very active. Staying seemed impossible. When I moved in, a studio in San Francisco cost ~$1,200-1,500. ~$3sqft/month. 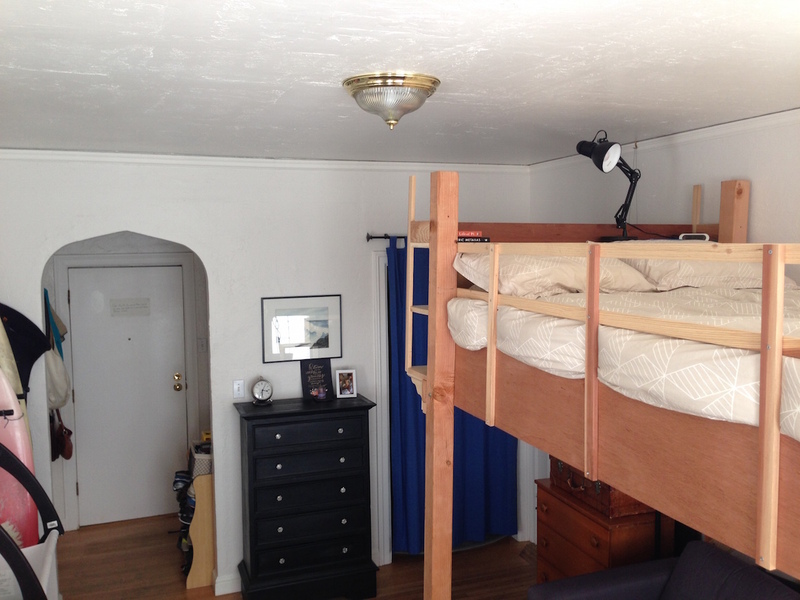 By the summer of 2015 a 2BR in our neighborhood of San Francisco would fetch ~$4-5k. $5.50/sqft/month. That is a big increase in itself. But when you do some algebra to figure out the cost per sqft gained it gets even bigger. For those extra 400sqft we’d be paying $3,200 or $8/sqft/month. Essentially we’d have to pay four times as much rent for twice as much apartment. A tough bite to swallow. Thanks to rent control we had low rent on our studio. But thanks to rent control we were financially disincentivized from moving anywhere else. It was a very strange feeling. We explored other options: doubling my commute or moving to a neighborhood with higher crime rates. In the end we decided to make it work for a bit longer. We had hoped a raise at work, a transfer to a new location or possibly changing companies would make things easier. We needed about 6 months to explore options, come to a decision and implement a change. Our closet nursery. The crib fit wall to wall when I removed one side (the one you can’t see). My wife and I were 27 when our first son was born. Significantly younger than the median San Francisco birthing age of 33. We also made a decision to have my wife stay at home with the children. Neither of those things are strange for a family in the United States during the last century. But both of those are strange for a San Franciscan in 2015. I didn’t realize all of the effects that decision would have on our lives in San Francisco. There is probably enough there to fill a blog post, but when it comes to apartments, it meant that it was even harder for us to find a place to live. Our competition for 2BR apartments in San Francisco was fierce to begin with. Sure, it is expensive, but for us it wasn’t only cost issue. We would apply to places and not get selected. One of the key criteria landlords look at is total income, and since we had one income, we had a steep disadvantage over working roommates and DINKs. We would show up to open houses for 2BR apartments with our application filled out, only to find 20 other people doing the same. Landlords had their choice and the place would inevitably go to a pair of young professionals with combined salaries somewhere in the low gazillions. Or maybe a family, but one a decade older, a decade further in their career and with a decade of extra raises and promotions under their belt. Living outside the norm had put us at a disadvantage. Density is a thing not many people think about when it comes to their homes, but I came to realize that it was the most important measure of space. Any time you have an optimization problem, you need to identify your limiting factors. In a house, it is density. There are two very distinct types of space in a house: high density storage space and low density living space. In order to optimize a living space, every cubic foot should be pushed towards one of those boundaries. Many people struggle with space because much more of their home volume occupies the awkward middle ground. Their living spaces are cluttered and their storage spaces are not packed. They try to solve their space constraints by getting a larger home, which is exactly like trying to solve a waistline problem by buying larger pants. This was a very important thing for me to realize in a small space. If we didn’t put things away or if we acquired anything extra, the space felt cramped and our desire to move to a bigger space increased. It was a constant battle to keep this space as unoccupied as possible – always trying to reduce to get that number lower. Our youngest slept surrounded by dad’s favorite things and mom’s sense of style. We tried to keep things very organized, everything had its place. At the opposite end of the density spectrum is storage space. The ideal storage density is 100%. Achieving that is impossible as the more dense the space gets, the harder accessing the items becomes. Consider that a cleared walkway to access items in fact reduces your density. That is why, to optimize, certain libraries have movable shelves where only one is accessible at a time – it maximizes storage space by reducing redundant access space. 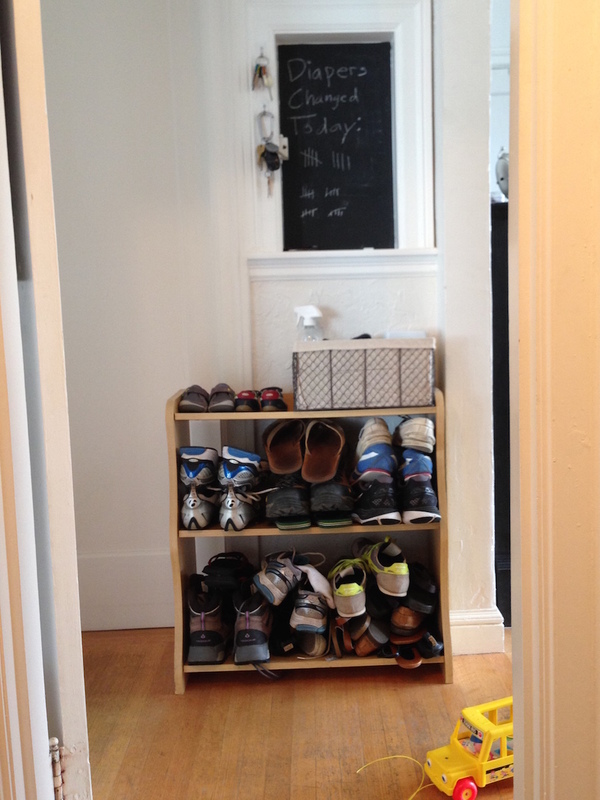 Some storage space, like a closet, is obvious, but one trick I had was to make new storage space wherever possible. Our coffee table (seen two photos up), which sometimes doubled as a changing table, was made from an old trunk I put legs on. It perfectly fit all of our extra guest linens while serving its other roles – reducing the amount of non-used space. (Yes, we had overnight company – even post babies.) You can barely see a few tubs under the couch in a picture below. I ordered different legs for the couch so that the tubs would fit, giving us a few extra cubic feet of highly organized and easily accessible storage space. I left this picture out at first but decided to add it. The rest of the house looks so nice because nearly 50% of our possessions were in this 3’x4’x8′ closet. I built extra shelves, double deep hanger racks and packed it to >60% density. We had no external storage, everything we own is pictured or in this closet. When you think about those two types of space, you realize that your housing needs are dictated by the sum of your lower limit of living and storage space. You can dramatically reduce your housing size needs by forcing things towards those limits and then reducing either one. Thinking just about living space, most houses have way too much. Remember, living space is usually only 10% occupied by what is in the room – the rest is air. Since one person can only be in one room at a time – and often people aren’t home at all or are gathered in one room – at any given point, most rooms in American houses are empty. That is a giant waste of space and money. 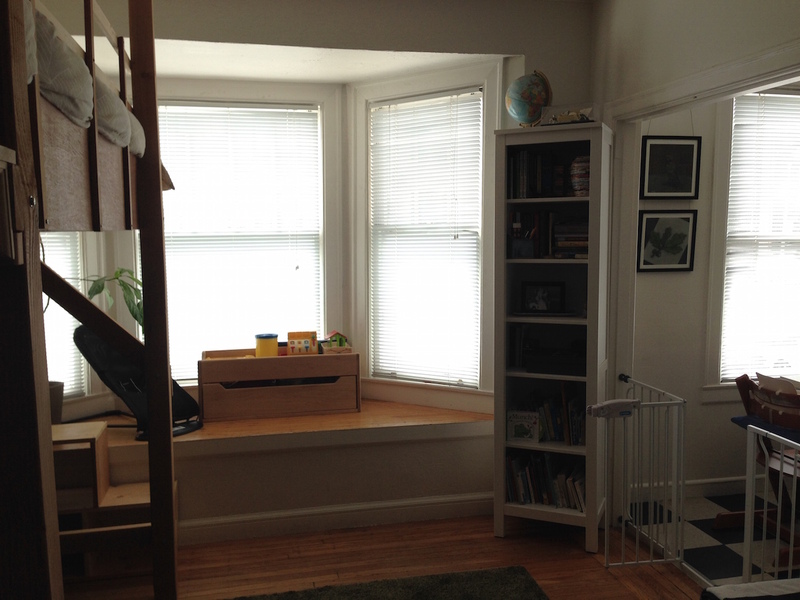 Our living room doubled as our bedroom when we moved our son’s nursery into the closet. I designed it with the intent of keeping the perception of 10% density when you were sitting on the couch while avoiding reducing our floor space by the area of the bed. The bookshelves behind the head double as the space underneath our headboard shelf. It gives you something to look at when you walk in the room other than a bed and kept the pillows from falling off. I also minimized the number of support beams on the front and sides – you can see there is nothing coming off the leg closest to you. That reduced the feeling of clutter and decreased that chances of head-bonking. I also built stairs that doubled as a bookshelf and since they had no backing, they let in a lot of light. The fact that they were stairs was critical as I built this when my wife was six months pregnant. She was able to get up there until the day before our second son was born. The second method I mentioned above was adaptability. It is one I didn’t have a chance to experiment with, but I love these examples. The idea is that your house changes shape to adapt to the current need. For example a wall moves back and forth between a bedroom & living room so they are both larger when used without increasing the total space used. 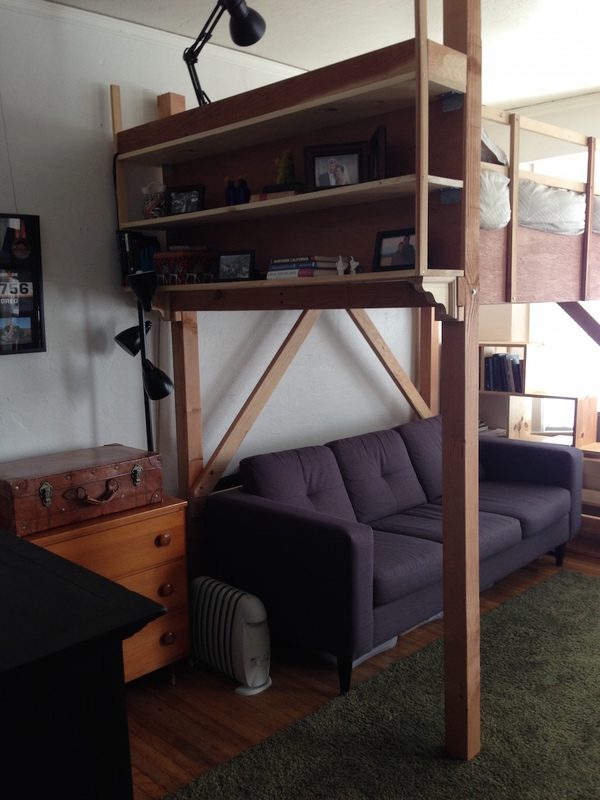 I would have loved to have the loft bed on an adjustable riser system. The height it was at was sub-optimal for both living & sleeping. But that would have made the build much more complex and wasn’t in the cards for this period of life. Here you can see the bookshelf that doubled as stairs. The final two ways to reduce living space involve reducing. The hardest step for most people but easiest to get gains from. The simpler your goals for a house, the easier it is to have a small house that provides them. Our living room didn’t need to serve as a TV room since we didn’t have a TV. That meant our furniture arrangement didn’t have to take into account seating positioning, cable inputs or speaker placement. Finally there is the factor of number of rooms occupied. This is the one that ultimately got us. As our family increased to four people, it became impossible for every person to be in a unique room. That posed significant challenges during nap time, bed time and when having company over. We could have made it a bit longer, but this is the item that would have gotten us. I already discussed the former point, but I’ll take a moment to reflect on the latter. We loved the light we had coming in. The west facing windows and wide street resulted in lots of afternoon light. For three years, we donated at least one grocery bag per month to thrift stores, slowly paring down what we owned. As the space became tighter, the bar an object had to be above in order to earn a place in our house kept getting higher. I started to really think about what I owned and why I owned it. I became a more conscientious owner of things. The possessions I own now are such a reduced and fine tuned representation of my current needs that it is hard for me to find want for anything else. As things got harder, I also found ways to hack the system. I now use craigslist as something between a rental shop & storage facility. Buying things for a season of life and selling them when I won’t need them for a while. I have often even turned a small profit doing so. I also found ways to hack myself. A lot of the things I owned were in my house with the purpose of ‘I might need this someday’. I had to work hard to convince myself that I didn’t. In the end the compromise came down to this – ‘if you get rid of this and need it again, you have permission to buy it from Amazon with same day delivery’ – so far that hasn’t happened. Consider that you are paying rent for your stuff. 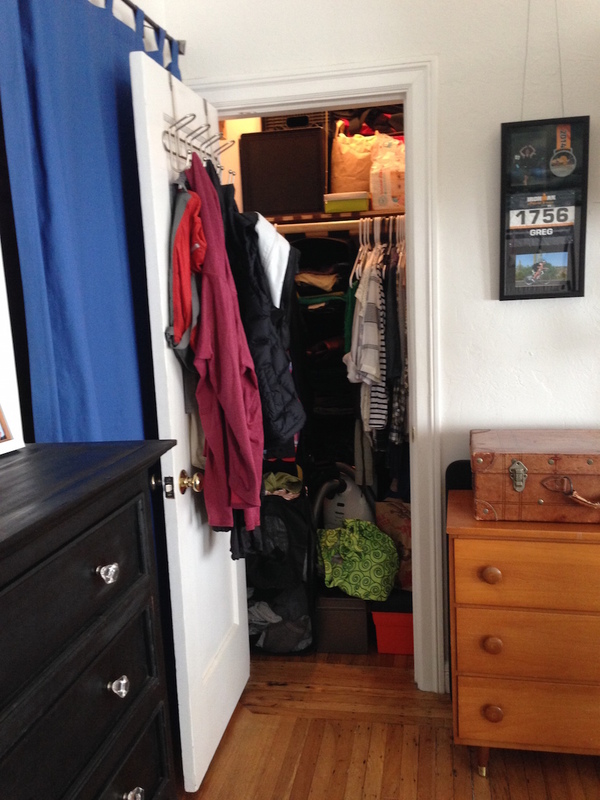 That closet space, or worse yet, storage unit, is costing you money every month. Eventually you will spend more in storage than the contents ever cost you. The shared economy is a buzzword you will hear, but the idea is nothing new. Uber is to cars what city parks have long been to backyards. 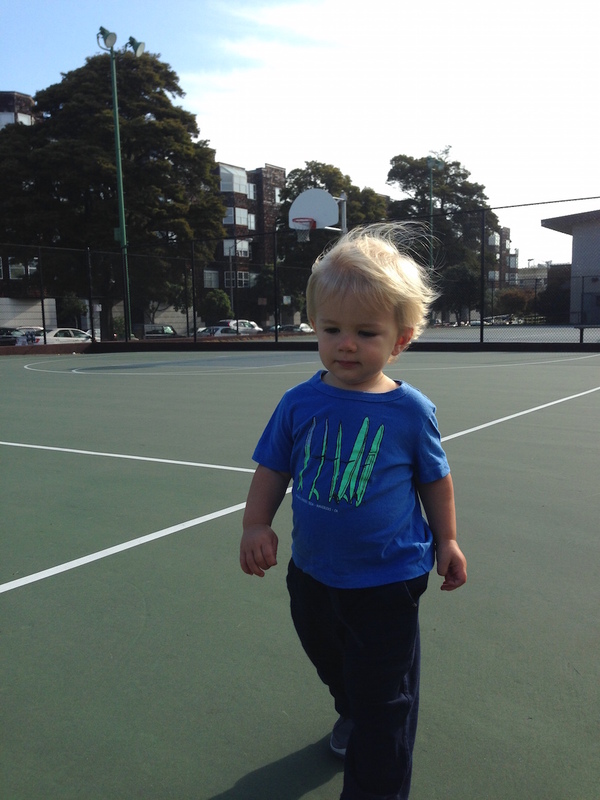 While living in the studio, our family made heavy use of San Francisco parks. What I lacked in a yard I made up for on early mornings with our oldest son at any of the five parks in walking distance to us. Before I left for work, we would head to the basketball court where he would play with cars or chase a tennis ball around and I would work on my jump shot. Early morning with the basketball court to ourselves. Speaking of shared assets, we live in an age where owning books, CDs or DVDs is wasted space and money. Most media sits unused for the majority of its life. It was once the case that access to information was rare, which is why owning a library had a benefit. But now we have the Internet – round the clock access to more information and entertainment than you could ever consume. There is no need to own. Public libraries are free and there are plenty of ways to rent things when you need them. Living in a studio apartment was hard. It took work, planning, organization and commitment. But there was a silver lining. Having less house has benefits in reduced housework. One of the most obvious is that there is less to clean. There are fewer shelves to dust and less floor to vacuum. There also isn’t a need to furnish and decorate as much which reduces stress, cost & time spent planning. We didn’t lose things often. Living in a small space forced organization. Everything had a place and we all knew where that was. Even if you did misplace something in the house, there weren’t many places for it to hide. You would find it much faster than in a large space. More house always comes with more house work. More yard with more yard work. In a world with finite time & money, reducing one thing allows you to increase another. Less time cleaning a house can mean more time living with the people in it. Thinking on all of our time in that apartment, I can recall many of my favorite times. None of them have much to do with the apartment – they all have to do with the people in it. Whether that was our family, my former roommate, visiting friends or extended family. The highs we experienced were no different than any other family’s. In contrast though, the lows were much lower. Now, I don’t mean the personal lows one family might encounter: illness, strife, financial woes, etc. Those would likely be as low no matter where you are. I am specifically referring to the lows that are more directly tied to the living space. In a small space, the typical day is ok, but there are such thin margins of free space and separation. There are times when all of this implodes. One thing going wrong can tip the next wrong domino and cause a chain reaction. Another view of the nursery. 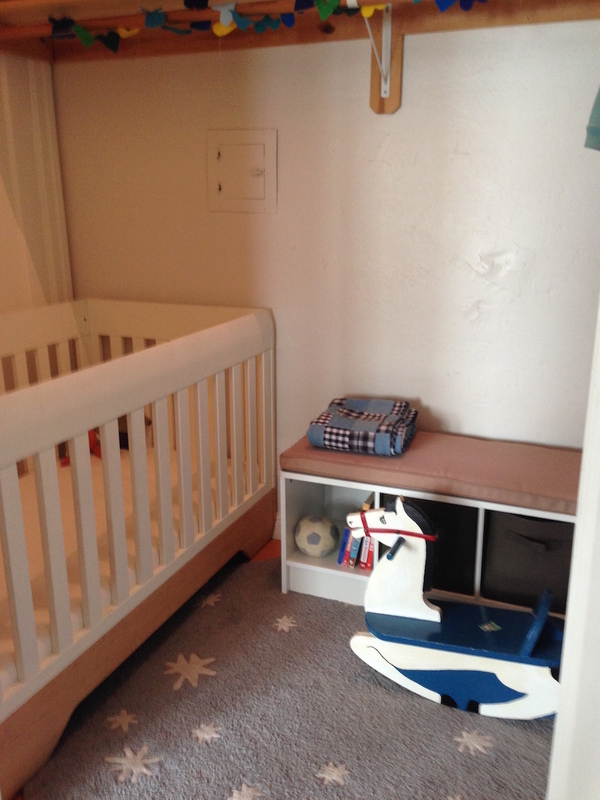 Here you can see the clothing storage & changing table. A final, and more humorous situation I would often find myself in was early morning meetings with nowhere to go. The 12 person start up I moved to San Francisco for has grown into an international software company. That meant I’d sometimes be needed for early morning meetings at 5 or 6am. My typical day, as is common with San Francisco tech companies, usually started closer to 9 or 10am. Rather than wake up at 4 to get ready & head into the office before a 5am call, my strategy had been to take the call in my PJs and then get ready and commute afterwards. That worked great when I was single, had a roommate and even when my wife moved in. But once the babies came onto the scene it was tough. You never want to wake a sleeping baby. I tried the bathroom, but the babies would wake up. The eventual solution was to take the call from my car in the garage. I am proud to say I’ve helped close million+ dollar software deals in my PJs sitting in a car parked in my building’s communal garage. But there were definitely some days I would sit there thinking ‘what the heck am I doing right now?’. We had some really tough days but in the end I live a life of many blessings. Reflecting on these days, however, has given me much more understanding for those living life with less margin. Whether rich or poor, a normal day is a normal day. When you’re wealthy and your car breaks down, you can get a rental. But when you’re poor, paid hourly and your transportation fails – that sort of thing can just compound into a really bad situation. Sick days can mean extra expenses and lost earnings at the same time. I think there are a lot of misconceptions about poverty and even lower-to-middle class working lives. If we better understood margin and variance, it would really help us become more sympathetic and caring people. In cycling culture there is a thing called ‘Rule V’ that states, HTFU (Harden The F-word of your choice Up). It means that even though the hill is steep, it is cold and raining and you are tired, you toughen up and ride hard. If you want to be fast, that is what it takes. The hard work you put in that day makes you stronger for next time. That rule very much defines my approach to life. 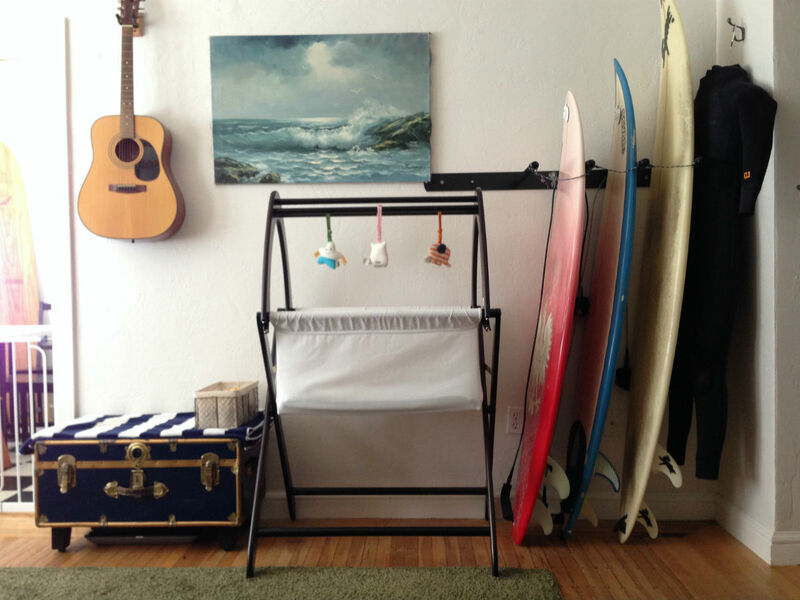 Living in a studio apartment with one or two babies was a constant challenge to HTFU. As I stated above, living in a small space was tough, there were days I wanted to give up. The space was too small, the noise was too much, there was nowhere to go to be alone. But fighting through those days is how I would get stronger for the next day. We humans have a strong ability to adapt. Sometimes that actually works against us. If we live with a certain amount of luxury, we will become accustomed to it. The trouble with getting used to an easy or expensive way of living is that none of us know what is next. In the start up world we talk about something called runway. It basically means how much time you could keep operating if they money stopped coming in. For many companies, that time is very short. For many families, it is even shorter. That is an extremely vulnerable place to be. The reason I think it is so important to always keep expenses down is that it has the dual effect of decreasing your burn rate and increasing your savings. The two of those combine to allow you more runway. When you have a lot of financial runway, it allows you to make decisions based on reasons other than money, because you know you will be ok even if the money stops coming in for a while. We chose to save money by living in a smaller apartment, biking to work, switching to a low cost cell phone plan and rarely eating out – among other ways. The result was a lot of runway and the ability to do some cool things – like taking a year off of work in 2017. While we talk about runway, there is some amount of money, that is enough runway to last your entire life. If you could save that much money, and stick to your spending budget, you would never need to work for money again. That is true freedom. I recognize that not everyone has a chance at that kind of freedom. Some people have to work long and hard just to scrape by. But many people repeatedly sign away their freedom by choosing bigger houses, nicer cars, more convenience and luxury products. If that is what you value most, so be it, but in our family value freedom and flexibility. Final point here – don’t forget about the importance of compound interest. I will remind you that $2k per month saved on rent for one year is $24k. Invested for 50 years averaging 6% interest comes to roughly $450k. Freedom. HTFU. A few months ago we moved out of San Francisco and that apartment. In the end there were a lot of reasons, only some of which were the limited space. We ended up moving to a less expensive city (Seattle) and getting a 2BR for much less than we had been considering in San Francisco. It feels huge. We don’t even know what to do with most of the space. Everything feels a bit careless in placement without the tight constraints that forced us to think very carefully. But, I am forever ruined. I will never again be able to think of a house in the same way. I will never be able to think of stuff in the same way. My definitions have all been altered. And then there is you. You don’t have to live in a studio to benefit from these lessons (though perhaps that is how you found this post). Whatever space you occupy, perhaps there are thoughts above that shift your perception. It is those seeds of thought that can take root and grow into actions. As my wife and I look at places we might want to live we do so with new eyes. As we think about the future and situations we might want to steer our lives towards, our goals are now different. The sacrifices we might have to make to allow them seem less challenging. The trade offs more manageable. I am not sure what the future holds, but I have some ideas that I am very excited about. I will forever be grateful for that studio apparent, our kind landlords and how that period of time helped shape the path we will walk. Wow! Thank you all for the kind words & healthy debate here in the comments and on other websites and social platforms. It is so interesting to watch people of very different beliefs and backgrounds have such broad conversation from 4,000 words. We are a family that decided to make a somewhat unconventional tradeoff for a period – choosing to sacrifice space in order to save time and money, while continuing to live in a place we wanted to be. During that time we benefitted from others who had shared their learnings from similar situations and so we hope this post will help others in the same way.. I remember our visit with you all in 2013 before all of this work. You have both done an amazing job at the “space” issue and are doing an even more amazing job in the world of parenting. Thanks for sharing this. Enjoyable read and motivating! You’re so right, Greg! My husband and I lived with 4 kids in a studio coop in the NYC area for 11 years. It changed me. I will never complain of not having enough space, the problem is I have too much stuff! I know your musings will help a lot of people. God bless! Fantastic explanation of the principles behind minimalism and the benefits once you achieve it. 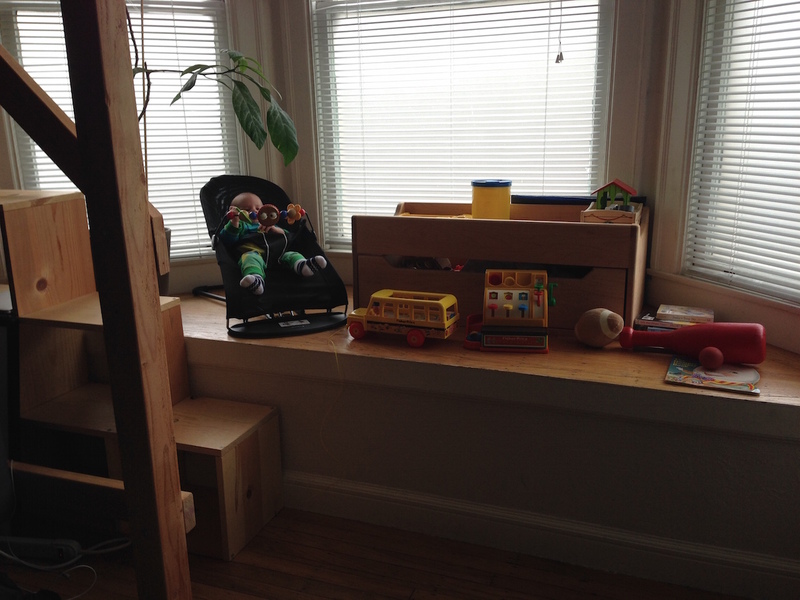 We are a family of four living in a loft and I’ve started a business helping families in SF de-clutter and organize, and am still trying to get there myself. I know how thing can get “out of control ” and that reversing it takes time and mental hurdles. Thanks for writing this. My wife and I spent many summers living on our sailboat. Teeny tiny is great! I had to give this article another read through — it’s that well written. Will also share with others as you have addressed many important issues to consider when considering how we live in the spaces we choose. What a beautiful piece of family history for your children. When I was two in 1980 my parents moved our 4-person family into a 550 sq ft one-bedroom apt in Manhattan. The six years we spent in that apartment were some of the best years of my life, although I’m pretty sure my parents have more mixed feelings about it. This post brought up a lot of great memories. Thanks! Great article. I agree that getting to be a conscious owner of objects is important, as most of the stuff the average person owns are carelessly owned and not needed. Took me moving countries to realize most of the stuff I owned, I didn’t event touch for years. WOW! I really enjoyed your story and it touched me in a familiar way. When we first married 23 years ago, we sat on bar stools and ate dinner on the “Iron-A-Way” ironing board that lowered from the wall into the kitchen. It was a great time and we lived a very frugal life. Those days are coming around again as our own kids are now heading to college and we want to help them as much as we can. Such an enjoyable Read. Thanks for sharing. “imagine you are paying rent for your closet/storage ” has motivated very much me! Unfortunately many of us don’t have the woodworking and engineering skills to redefine our small and storage spaces in the way you did. The first step to mastery is to attempt. Anyone else lacking in skills might peruse IKEA (or better still, peruse IKEA, make your selections and then shop for them on CL or FC or even FB). I hopped over to say “Welcome, Greg!” and I just couldn’t help myself. Wikihow and Instructibles along with YouTube give everyone free tuition at all hours on all diy projects. No excuse these days for not trying. Those with absolutely no interest in trying should get quotes from tradesmen. 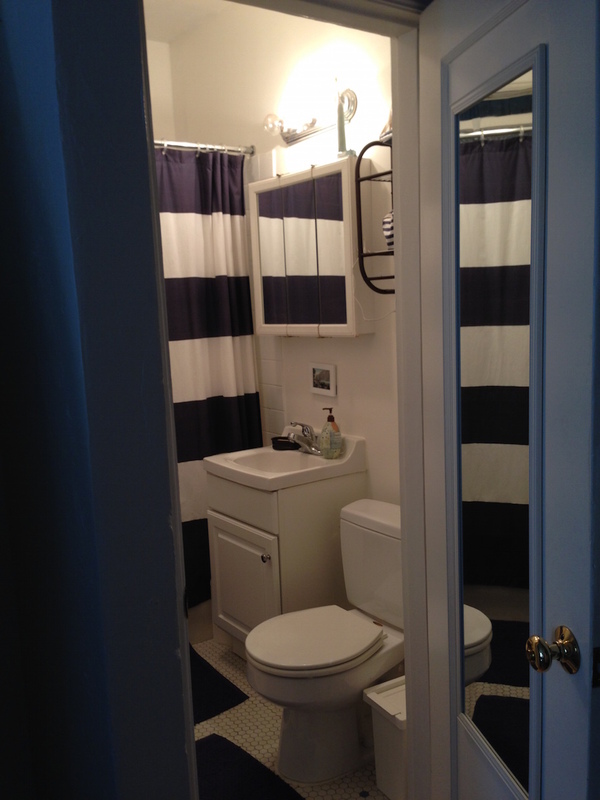 In the higher cost than basic readymades is the skill and labour required to get a custom fit. It often ends up costing less than moving or buying high end goods anyway. Great article. Reminded me of what I enjoyed about my own life in a studio flat. Thank you so very much for sharing your journey. It’s simply inspiring. I had been on this minimalism journey for about 4 years and recently had been on a KonMari journey. What you said really resonates with me especially when I am struggling to pare down my stuff to what really matters. Bookmarked this to come back and read again. Thanks for this great read. I often thought, “Damn, he sure sounds like a mathematician. It’s like he’s reading my mind…” Nevertheless, it’s great to hear someone else made it work in a studio with children. Your story reminds me of that of the Love family detailed in Ken Burn’s “The West”. They struggled and survived due to sheer grit on an isolated sheep ranch in Wyoming…but in my estimation, they should have realized their toughness would only deliver survival, not prosperity. You should be proud of your ability to survive in SF, but you should also realize when it is time to stop toughing it out. Wonderful article. Lots of wisdom. Wanted to point out a small mathematical / finance error which if you correct should tremendously enhance the point you are making. Saving $2k/month should come to $7.57 MILLION @6% interest not $450k!! You have assumed that you save $24k/year and it compounds only once a year (24*(1.06)^50 = ~$450). If you deposit $2k/month and it compounds monthly you should get $7.57 MILLION not $450k! Even if you assume semi annual compounding it should be about ~$7.29 MILLION . See the future value formula here http://www.graduatetutor.com/corporate-finance-tutoring/time-value-of-money-formulas/ or use the ‘=FV(….) formula in excel. We tutor finance to MBAs, CPAs and CFAs and had to point this out. PS: If the formulas are not clear, I am happy to walk you through it during a 5 minute call. Thanks, I meant that single year’s $24k if you only did it once. Thank you for writing this! My husband (who found this article) and I live, work, and travel full-time in a renovated 144 sq ft RV, and this articulated really well several of the realizations we’ve had along the way. I’m going to have to start borrowing your phrasing of “high-density storage vs. low-density living space” when people ask how we make it work 🙂 (our organization strategies are at gogo.gen.co/organization if you’re interested). Thanks again! As a recently married couple, it’s refreshing to see how your family chose and embraced your constraints, and through doing so, you not only found a way to survive, but to thrive! Your writing has inspired us as we are also considering an unconventional path for two young engineers under 30. After some major life events, I found myself living in a single room above a barn. Just me and a cat. It had a tiny bath but no kitchen. There was space for a single bed, a dorm fridge, a microwave and a few crates of my records (which made great tables, etc). I was out of a job at the time and couldn’t beat the $100 a month rent and who wouldn’t want sheep as neighbors. I learned to live without much of the stuff I had before and actually enjoyed it. I’ve moved on to bigger places but to this day I still resist obtaining more stuff. Except records. You can never have enough vinyl. Thank you for sharing your story…. I live in Toronto and funny enough I read your story after my neighbor forwarded it to me ( we quite often discuss who will move first to a bigger house cause our homes are so small….under 1000sq). My husband and our daughter moved back to Toronto just less then 2 years ago due to the long commute every day for work. We moved from a 2000sq home to a 920sq. I remember when the movers placed our last box in our dining room I couldn’t see any of the windows….I remember thinking how in hell am I going to fit all this here? Slowly we gave our things away to friends family and shelters. I cant believe the stuff we still own. I loved the idea you gave about “get rid of it and you need it again buy it on craig’s list” I never thought I was paying rent to store my belongings….but its true! Our friends quite often ask us how do we manage to live in such small space…I love it and like you I learn to adapt and love the fact that we use all our space every day. With your story I now will de clutter even more and appreciate every inch of our “tiny” house. 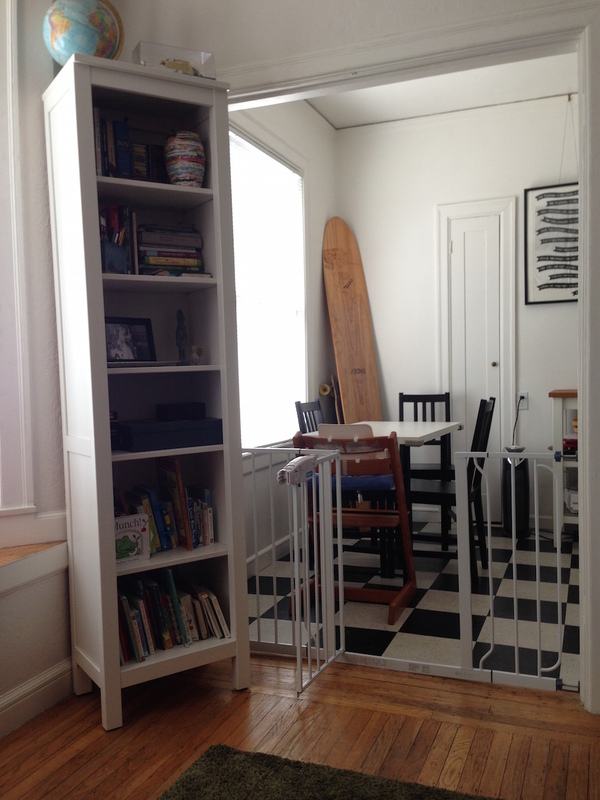 Your love was surfing and surfboards, so space was made to accommodate-what other hobbies/crafts had to have space? Does your wife have hobbies/crafts too? Yep, most of her hobbies don’t take up as much space though. Surfboards are just kind of big by nature. You can see signs of her handiwork/crafts throughout the place. So the partner with the money and the job has the big surfboards, and the stay at home parent’s hobbies just don’t take up as much space because…. they don’t. I mean, people who like to do textiles don’t like to have looms, or anything (just assuming it’s textiles. it’s textiles, isn’t it). I’m sure if he threw out his surfboards… never to surf again… his wife would be much happier. Really loved reading this article, and your conclusions about this. We’re a family of 5 in a 1,600 sq. ft. house w/ no garage, which most people think is too small. We chose to stay here rather than upgrade to a larger house so we could save for our kids to go to college, and for retirement. The oldest kid has just moved out (after 2 years of paid-for college), and our middle has just started college. She plans to live at home for the whole time. All around us people are bemoaning the high cost of their larger houses, their kids’ tuition, etc. Our choices were different, but not really hard to make when we looked at the big picture. The day-to-day of living in a smaller space is the challenge. But the flexibility it gives to other areas of life is great. How has the transition been to the new apartment? Did/Do you feel frivolous spending money on more housing than you actually need? Is your wife on the same page (e.g. working towards the same goal) with you or is it a matter of compromise? I think a 2BR is nice but if I could design my own I might make the common area larger and the rooms smaller. Maybe I’ll have to take my woodworking skills to the next level and build a house myself next. This was a fun article to read. When my husband and I were first married, we moved into a 1000 sqft, 2 bedroom apartment in San Francisco. 4 years and 2 kids later, we just couldn’t make it work for us anymore. I wish I had known more about being minimalist at that time, I think we could have stayed there longer. You mention that you had a garage though…we didn’t. Having to walk several blocks from my car with groceries and a newborn and a toddler, sometimes uphill…that was what really did it in for me! Thanks! Great article! This looks like my old studio on Geary and Jones before I moved to NYC! I miss having less stuff!! Still trying to downsize! Thankyou so much for this article. It gave me inspiration to give away so many thongs..that I had stored hoping I would use it some day. I could go in and fix that comment for you, but… that was a pretty epic autocorrect. Your wife must be amazing! At least you got out to go to work, I’m impressed that she could make that small space work with two little kids. Clearly you’re both great problem-solvers. Thanks for some great ideas. She saw this comment and confirmed you are correct – she was there more than I was and so it was more intense for her. She said that taking walks outside & to parks made it easier. I thoroughly enjoyed reading this article! I’m very impressed with how you and your wife made such a small space work for you. Your story is very inspiring! I’ve been going through my possessions in my spacious 1,000 sq ft apartment and making decisions as to what stays and what goes. Your story has given me the courage to continue pairing down! Less is definitely more! Keep going, you will thank yourself. I found that I could fill a bag pretty easy and then it would get tough. I’d really have to think about something. If I didn’t have a strong reason to keep it, I’d put it in the bag. That is when I knew I was getting to the good stuff – that my bar was being raised. It is like a muscle, the more you use it the better you get. I lived once with my family (husband and three children) in a 100m2 apartment and it went well. Its all about being organised, tidy and creative. We enjoyed it being able to save lots of money every month to spent it on nice holidays with the kids. Thank you for sharing your inspiring story. I am about 2 years into my becoming minimalist. Now I am into the Magic of Tidying Up and it’s facebook groups. I really like your idea of keeping more open space in the living areas and storage tight. Your whole article is good and well written. It took me to your space. 🙂 I am ready to rework some things in my home after reading that. Wonderfully written. Points I have learned and love and points I had yet to consider. We are considering a move to a small mountain area where we would most likely rent a one bedroom loft for ourselves and our two daughters. I started out hesitant but I’m growing more and more excited at the opprotunity to downsize even further! This was such a great read. My husband and I were from the Bay Area and know the costs all too well. When my husband was eligible to retire at 50 he asked if I’d be interested in quitting my job of 20 years (that offered no retirement save for my own 401k contributions) and buy a 32 foot RV (about 275 sq ft). We’ve been on the road for 3 years now and love it. Downsizing was hard in the sense that we have to carry 4 seasons of clothing with us at all times…along with stuff for our hobbies (guitar, writing, books, photography) and our 3 pets (a dog and 2 cats). We certainly had to get creative with storage. I’ll be bookmarking your post as a reminder. We’ll be looking for a small home in the next year or so as we’re kind of attached to this small living. However, I wouldn’t mind moving up to something around 600-700 sq ft. Haha. My husband and I live in a 600sq. ft. apartment in San Diego with our two kids. Our situation is very similar, and I relate to this 100%! Thank you for writing this and sharing your experience. What kind of tiny crib next to the surfboards? I’ve never seen anything like it. I would love to know about the bassinet as well. About to have child number four in a 3BR home in the UK where room sizes are minuscule. I hope you’ll take up writing as a vocation. What a pleasant, easy, informative (and grammatically correct) read! My husband and I are retirement age, although we’re not clear what “retirement” is. We spend summers on a ranch in NC where we live in 250 SF. My Sprinter cargo van is my garage with all the tools I use to do the maintenance on our friend’s seasonal ranch. Then we head back to the Dallas area for the off season to our 1200 SF absurdly cluttered and disorganized 2 BR condo. We remind ourselves we downsized from our 4 BR home 2 years ago but still are trying to reach the simple comfort we have in our 250 SF abode. We never spend time “at home” in NC. We are always out and about, chatting with people, dining with friends, sitting at the campfire. In Dallas we feel like hermits. Living small has definite advantages. Living uncluttered at any size is so much healthier physically and psychologically. Do write again, though, when your children are teens…… Therein is the test of being too small/close. Remind me when we moved from Puerto Rico to Fl. Now we live (renting) in a 4 bedrooms home. I feel that is too big. We are couple with 1 bio son and 1 foster kid. My family (me, my wife and 4 young children) lived in a 90 sq ft caravan for 3 and a half years, parked in the middle of a meadow in very rural France. We progressed to a one room barn with split upper room for the children’s beds (which is still part of the open plan). And that’s how it has remained for the last five years. Yesterday was a big day for us, we got running water into the barn for the first time. So I understand all about this scenario. These years have been among the best years of our lives. They make you positive, resourceful and united. In Vermont in the 1960’s my then husband and I built a 16’x20′ house in the woods. We figured out at one time that if we lived with 17 other people, all the btu’s produced would make it unnecessary to pay for wood (our fuel at the time). The rental situation in Boston, where I live now, is now roughly equivalent to San Francisco’s. I cannot imagine how people manage financially, even in their 30’s and 40’s with presumably decent salaries. Seattle’s a great city, but sorry that had to be your solution. 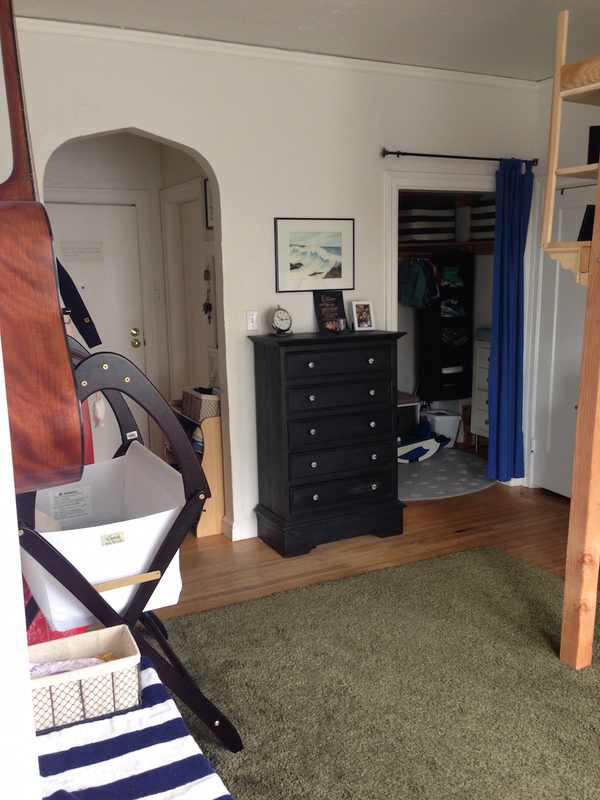 Life forced my son & I into smaller living space and we discovered some of the same things. It took some retraining in “is it something we/I NEED?”, because “want” slips in really easily. But we are more comfortable in it as time goes on. -Get me used to living small so perhaps retirement can happen and be fun and manageable. Eye on the prize, and living as well as possible meantime. Thanks! One of my happiest times was moving into a studio apartment in the San Fernando Valley with minimal furniture and my beloved cocker. Any time off from work, we would walk, go to the beach, parks, the mountains, and take many trips. I felt unburdened and footloose-fancy free. It lightened my heart and gave me a mental rest after taking care of a terminal family member. I have since moved to several large and larger houses and then I got smart. I bought a trailer in a nice park, (paid cash) and downsized. I am finely enjoying life again. Craigslist is a great way to sell stuff. Thank you so much for sharing your story. We are in a similar situation, but living in Chicago, and hearing your positive experience is incredibly motivating. We have decided to stay put in a one bedroom apartment post baby so we could live off a single income so one of us could stay home with our son. We love our apartment’s location and also don’t want to sacrifice safety or time to move into a bigger space further west. But we’ve been starting to feel the cultural pressure to upgrade to a more complicated lifestyle. But we’re making do with an eight month old, two dogs, a cat, and enough space left over for a painting studio. Reading your article was just the confirmation I needed that we’re doing what’s best for our family. I think I may just need to write up and share our story too! Thank you again for being an inspiration! That is why I took the time to write it. I look forward to seeing your post, make sure to comment here when you do so. Pingback: My love affair with space | What does the mom say? Just want to say congratulations and great article. You are both wise to start your family under the “average” of 32. If I may send a little advice? As your career progresses and your salary increases you will be tempted to splurge or tell yourself you “deserve” to consume more luxuries. It may be hard, but I hope you will remember these first years of your marriage and the essential joys you have experienced in keeping life simple. Blessings to you and your family. Enjoyed reading your story about living in a studio apartment. I am a pack rat, have stuff I can’t get to, don’t remember why I bought it. Save magazines with the thought to read them…someday! About organizing, etc. but never do it. Oh well, as you said, have to attempt to do it and just do it! Your wife is amazing! Two small kids, no TV, you must have a radio? 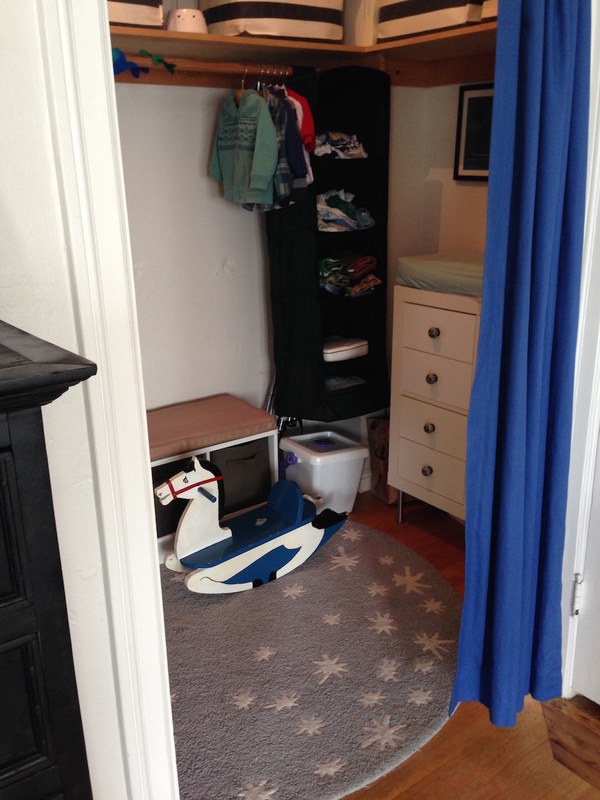 Ingenius how you fit a nursery into a closet and have room to walk into. I have a 12′ by 17′ room for my computer and stuff, and look at that stuff and wonder, Cilla, why not get rid of it. So, after reading your article, it gives me incentive to JUST do it. Thank you! thank you. I am asking my husband to read this. He is a hoarder/packrat and drives me crazy with it. He came from Haiti and I do believe the poverty there affected him deeply, even tho his family was never poor. He has great difficulty with letting go of anything because he might need it someday. Really wonderful read. I am shocked that your landlord allowed you to have 4 people in a studio. Even with rent control in SF, they can legally limit the number of people allowed in an apartment of a certain size (if they know about it). Really sad what is happening to SF due to the tech boom and ridiculous rents. As a 3rd generation San Franciscian (who owns) I can truly say the soul of the City is dying. So sad. We worried about that but when we told our landlords we were expecting, they were so happy that they got us a baby gift. We were blessed to have them in our lives. “We humans have a strong ability to adapt. Sometimes that actually works against us. If we live with a certain amount of luxury, we will become accustomed to it. The trouble with getting used to an easy or expensive way of living is that none of us know what is next.” Yes. Thinking of the worst possible situation coming next, is how I think. Mainly because of the highs and lows in my life. But as negative as it seems, and as tough as it is, I’m glad that I think in these terms. I want to be able to live in lean times, and be OK. Because it really is OK. We don’t need all of the stuff that we’ve been lead to believe we need. Thanks so much for taking the time to share your experience! Really helpful and inspiring lessons for all of us! And I thought being a single income family living in a 2 bedroom upstairs apartment in Orange County, CA was HTFU!! 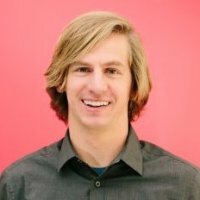 What a great article and peak into what life might be like if we ever follow the tech jobs to SF. Would love to hear how you think this affected your children’s development? Positives and negatives? Wow, Greg! This article popped my eyes open to the creativity and ingenuity required of you and your wife to make your apartment livable for so long. Though she mentioned to me, over the years, various efforts to fit better into your San Fran space, the statistical background, specific examples, and pictures you gave helped me suddenly SEE what she meant. Thank you for writing out these thoughts and efforts. Such a well written article. Our family is doing something similar in Texas to what you have shared. I agree that living counter-culture can be challenging sometimes. Most of our family doesn’t understand our minimalism or choice to live in a 2BR apartment with a family of four, but we love it! Thanks for sharing your experience. Thank you for writing this post. I love San Francisco – I especially love life near the beach. I’m a single mother pregnant with twins (by choice) currently living in a studio apartment. At night, I can hear the waves and I love it. My friends think I should move to the suburbs. I just found a lovely tiny one bedroom cottage that feels perfect. Again, it’s right near the ocean. This post helped me decide that I don’t need to live in a 2 bedroom apartment in the burbs. Now I know I can make it out here on my own and stay in the city I love, on a budget I can afford. Your words inspired me to have faith in my desire to stay near the ocean. Thank you for helping me make the decision! Our families thought we were crazy when my husband and I moved into a tiny 350 square foot loft apartment with a slanted roof in Logan, the second-most densely populated city in Utah outside of Salt Lake and Utah counties. Most of the 1,500 square foot houses in the area had been converted into 3, 4, and even 5 apartments with 3-story apartment blocks built in their backyard. The city didn’t know it wasn’t a small town anymore. We proceeded to move into a nicer apartment, with less than 250 square feet of living space, later on. We packed it all in in that room smaller than the average dorm. All I missed was having an oven, and we became the most organized we’ve ever been. I have been travelling the world partly as a tourleader and used to live in hotelrooms or beach huts! In the North of holland I live since 7 years in a studio alone. Feeling at times awkward and even ashamed sometimes as it’s not cultural normal for a 48 years old to live still in such a small place. Now the tiny houses trend got our way as well I start feeling trendy!! And thanks to your great story and all the reply’s I feel satisfaction. This is a way; good for us good for planet earth. Freedom to share and get up and go discovering more. Nice Story Greg. It gives me hope of not renting a very expensive flats in NYC area. BTW, I am about to be transferred to NYC for 2 years and I have to bring my wife and our 4 children in NY for vacation at least 1 month in a year. I have read some blogs and sites at it is illegal in US to have many adults in a Studio or 1 room apartment (I am from Asia so I do not know some of your laws, sorry for that). Just a question, is it OK if I have a studio type flat and let my wife and kids join me for one month in a (every)year? Thank you. Cool family :). All the best to you all! I believe that when you decide to have children, it is only fair to them (in this case fair to your neighbors too) that you have to decide how to care for those children. Part of care is to provide enough space to live in a way we expect outside the 3rd world. I am happy to read that you found a bigger apartment because a family in a studio is just too much. If I were the owner, I would try to evict. The bottom line is that you could have gotten a two bedroom in Oakland but you wanted your hipster location regardless of living standards for your building or even your family. So why are you posting this? Justification? Support? We considered many parts of the East Bay but not being able to bike was an issue for me. Maybe some day they’ll open up a bike path on both parts of the Bay Bridge. 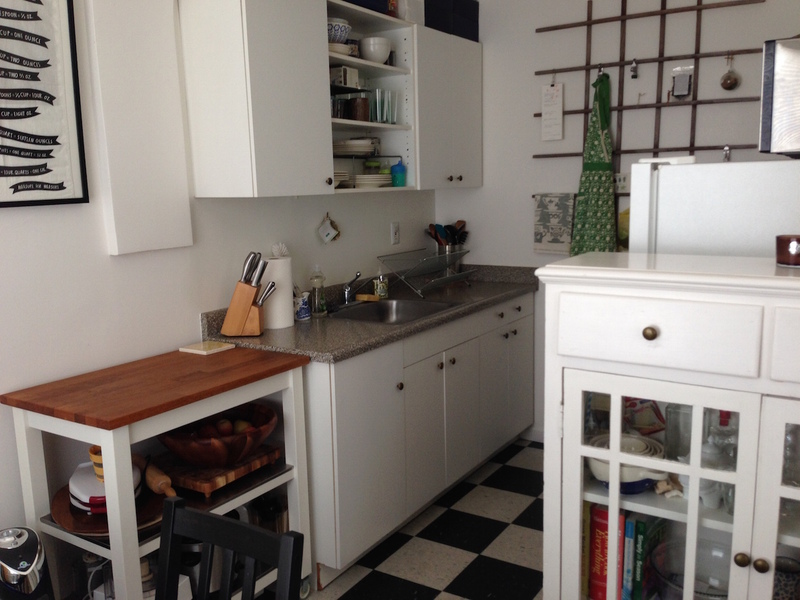 My husband and I live in a rent stabilized studio in NYC. It’s pretty big for a studio, but oddly shaped- the kitchen are being the widest and the “bedroom”, being a narrow end, which knocks out a lot of lofted options. We are trying for a kid and house hunting, but everything is nuts…even the outer boroughs, Long Island and parts of NJ close to city! I temp and he works in sales, but we both are heavily involved in theater and arts, so we want to stay in city. We often get last min gigs. Tried for an affordable apt., but just got rejected because we make a few thousand over the limit – took a new temp assignemnt in May which pushed us over. We’ll keep applying for things, but my income fluctuates depending on assignments I receive, so it’s hard to gauge when applying. We have savings, but while we could have 4 bedroom house in Indiana (where my sister lives), NYC is off for buying. I should mention, I love my neighborhood and my apt. I have a wraparound terrace and it feels like an extra room. Wish I could convert part of it to a bedroom, but can’t do that in a rental. We are playing with the idea of staying in the studio, even after having a the baby until we finally find the right deal. comments. My husband and I have been living in our 22 ft. travel trailer in an R.V. park for the past 3 months and we are loving the more simple life. As for the negative comments I wish more parents would teach their children that you don’t have to live in a big house and have lots of material things. Mom being home is so important. Good for you and your wife for realizing what matters. I just found this by googling “twins in a studio apartment”. It is very true everything you say. we live in a tiny studio in Rome but actually I’m from SF. That’s where me and my husband met. ANyway, its just nice to know, I’m not alone. So many wonderfully written passages in an altogether informative and insightful post. I felt better about my apartment and my LIFE after reading this! Thank you for sharing, and I’m glad that everything worked out for you and your family! I live in a small appartement in Belgium, with my kids and husband. For a long time I felt the four of us fitted in here nicely. Also we found out my oldest son has a severe dust mite allergy, so we had to give him his own room, and had to take most of his stuff out. We now have piles of boxes everywhere. Boxes with my footcare stuff, and boxes with my sons books and toys. I was just sitting here today, feeling like there is no room to move around anymore, looking online at houses (we can’t afford to move). But reading your blog gave me new fresh hope. I better get started 🙂 Thank you! Love this post! I was wondering if you know where/the brand name of the bassinet your youngest child slept in? Thank you! You have been creative about living in a small place but honestly, get a vasectomy or use birth control. It would be unkind to introduce a third child into such a cramped place. Third child has already joined us… but we’re in a bigger place now. You’re such a gracious commenter! I’m inspired by THAT! This is such a great post! My husband and I bought a 300sqf studio in São Paulo, Brazil inicially to rent, but now we decided that the project was so well planned (well, my husband is an architect) that we decided that we are going to move there with our dog. We live in an apartment 2 times bigger, but 40 min from downtown and we want to live part of the city, you know? I’ve been decluttering for a while now and I think that I have less things now than when I moved here, so I guess it will be easier to move the second time. We are also thinking about moving abroad, so I guess that moving to a tiny studio will be a nice step to have less things and start getting used to that. Just found your article; we are a family of four living in 800 sq feet in a city which we call home. There are three income levels in our world: 1) (Very) wealthy; 2) struggling (always struggling); 3) homeless. And, frankly, I see this as being the world we’re all living in, sooner or later. As Laura above noted, if you are a smidgen above a certain income level, you are ineligible for what is termed “affordable” housing. You don’t have many options. It’s either a long commute that estranges you from your loved ones unnecessarily, or sheltering creatively as you make your way through the stages of life. So, here’s the thing, and I direct this at those who are critical of the choices you made (though I understand you’ve since moved). We live in a world where the wealthy purchase and own residences as “pied a terres”, airbnb rentals and/or purely for speculative reasons. The desirable areas — desirable for reasons of culture, schools, access to amenities and care — are highly-zoned and restricted when it comes to development. When Mark Zuckerberg opts to own a massive “condo” in the middle of San Francisco which he’ll use once a year, which others is empty, and which removes square footage from already limited stock, he’s not going to be happy when the city decides to build a large, mixed use complex next door and he WILL prevent it from happening. In other words, the trend is toward more wealthy people taking up space not only within the confines of their McMansions, but within city blocks that have hardly any surplus and where they will fight to keep housing limited. For those who aren’t of vast wealth, they can get bleak houses in the suburbs and that means warehousing their families in dead zones, and then having less time to spend with their kids due to long, arduous commutes to nowhere. It’s perfectly reasonable to find a tiny place to shelter that allows you to enjoy the amenities you pay taxes for (“you didn’t build those roads”), the parks, the schools, the libraries and museums, to get home fast to your families, to play ball with your kids in the local park, to do homework in the local library, pick up take out from the bodega — and to feel, to know that you’re doing a swell job as a parent, a partner, a provider. It’s a trade off. I personally struggle with it, feel guilty about it, worry about it because I love my family. Ultimately, I have to make a choice for them that I hope will be the best one. A parent’s obligation is to love, provide food and shelter. Greg, you had found smart and creative ways of using your urban environs. You’d set a good example, provided useful tips and been a pioneer in the changing landscape of housing. Well said. Many people are not in the position of having to live in a less than ideal situation. But, those of us who are make the best of it, and are truly doing the best we can for our family. So, we are hoping to buy a house within the next year. We live in San Francisco 2.0, aka Seattle. As I’m sure you’re aware, there isn’t much within 100 mile radius under $250k. The last four years we haven’t had much of an issue being a single income household. We have been incredibly lucky with our apartment. We pay $1000 for a two bedroom. We have 4 kids and it’s pretty cramped. Renting anything bigger would at least double our rent if not triple. I wish we would have tried to buy when we first moved here… We honestly didn’t think we would be here long. Everything is going up right now, and everyone is trying to find a place to live. I ended up on this page because I searched “is it crazy for a family of 6 to live in 400 sq ft”. I do think that’s crazy, btw. I really enjoyed this post, though. It’s so similar to what we’ve been doing. I’m glad I now rank well in Google for searches with the term crazy. I very much know your situation – we’re in Seattle with 3 kids in a 2BR right now. I’d say if you can make it last for a bit longer, it might be worth it. The income to home price ratios do not give me confidence in the housing price trend continuing to rise. Maybe things will change in a year or so – and even if not, the saved cash of staying with your current deal could go a long way towards a down payment. 2001 i moved onto my 350sq studio. It was all i need at that time and still is 17yrs later. Thanks for the insights life in a small space is so much more Real. Thank you for this post. My husband and I (and 4mo old twin boys) are in the same Bay Area predicament. Do we spend $1200 more on rent for an additional bedroom, or try and make our one-bedroom apartment work for the 4 of us and save for something in a couple years? You’ve given me the inspiration I needed to stick it out and make the space work. I currently live in a rent controlled SF studio. A year ago my boyfriend moved in and we are now expecting a baby. There are two walk in closets and I’ve emptied the smaller 3×5 walkin to be a nursery nook. I’m a little concerned but considering that I’ve been there for over 6 years now even a one bedroom 45 minutes away in the east bay in a bad neighborhood would cost more. Praying we can make this work for a year or two. I’m feeling hopeful after reading this! all light colored furniture makes a space feel much brighter and bigger, also less cluttered. Pingback: The Rent Is Too F*#%ing High: Housing Rights & Options – Solo. Mama. Hustle! My 4 person family(my mom, dad , sister and i) live in a studio apartment. We have lived here for 7 years and there is no perspective for moving. I hate it. There’s no privacy and it’s so hard to study when there are 3 people also living in the studio. I am really sad abput that and i try ro cheer up myself that at least i’m not homeless but, man it’s hard! Don’t studio apartments usually limit the number of people that can live in them?